The blast of flavors and their telltale after-effects warrant a visit whether you live in the neighborhood or are making a trek from elsewhere. A tingling tongue, damp brow and glow of heat radiating from deep inside are sure signs of a fine Indian meal. Layer upon layer of flavor—extracted from onions, garlic, ginger, cardamom, cinnamon, clove, chilies and other ingredients during a long cooking process—build to ensure those after-effects. The depth and complexity of Indian food flavors has had me chasing them down since my 1970s college days wandering the then-ubiquitous curry houses of London. 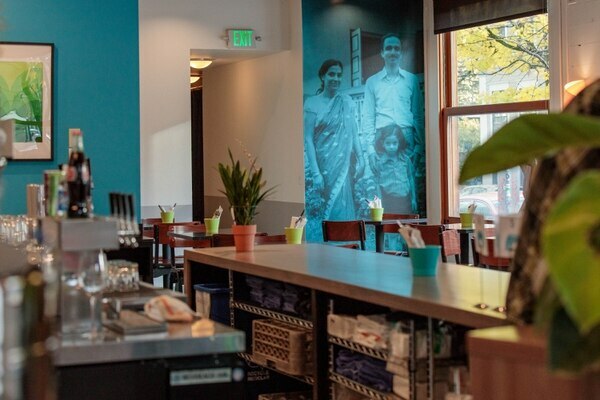 Portland's latest Indian allure is Bhuna, which recently opened in Northwest Portland. Bhuna's cook and co-owner, Deepak Kaul, is a renegade restaurateur, like so many children of immigrants whose parents expected their offspring to embrace a learned profession over lowly kitchen work. After a couple decades in the industry, Kaul has presumably set his parents straight: He may not be a doctor, but damn, he can whip up a nice curry. Kaul didn't start right away with his heritage cuisine. Instead, he had been cooking Western food for a couple decades until Bhuna officially debuted only a few months ago as a once-a-week pop-up at Culmination Brewing. 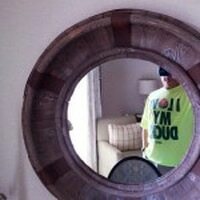 It was a successful shakedown run, drawing critical praise. For his full-time effort, Kaul wisely signed on front-of-the-house veteran Eric Bigger, who earned his stripes in New Orleans before returning to the Northwest and Portland in 2005. Bigger serves and generally maintains order in Bhuna's spartan L-shaped dining room and bar, leaving Kaul to cook. 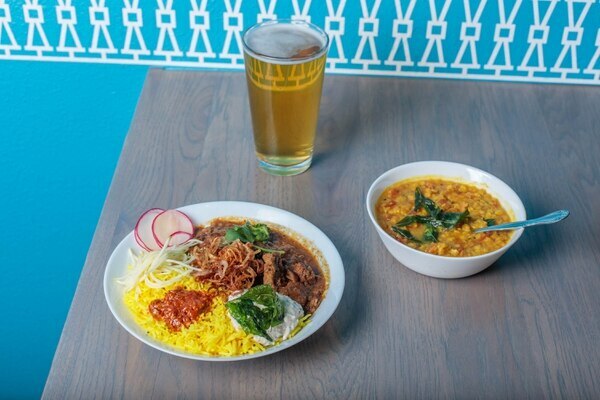 Related: You Can Now Eat Spicy, Funky, Kashmiri Soul Food at One of Portland's Best Breweries. The absence of ornamentation or warmth—quite literally on one chilly visit—is one of only a few gripes I have about Bhuna. Perhaps it's an unreasonable expectation, but Nordic minimalism doesn't exactly set an Indian mood. I'm not advocating colonial-era kitsch, but even a minor decorative makeover would be a big improvement, adding eye appeal and coziness. As always, though, it's the food that matters most. In that regard, Bhuna is a boon to the Portland area's small but vital group of worthwhile Indian restaurants. Those with a carnivorous bent will be pleased to know that Bhuna's emphasis on Kashimiri specialities means adequate meaty choices. The pinnacle is rogan josh ($16), which begins with chunks of tender lamb that really tastes like lamb. Swirling around and embellishing the meat is a rambunctious sauce, elaborately spiced, unsparing with chili heat, tempered with yogurt and flecked with cardamom seeds and even the occasional pod bearing witness to labor-heavy preparation. The chettinad chicken ($14) is far milder, but still gets plenty of flavor from a garlic and ginger enhanced coconut milk-based sauce. While meat dishes will satisfy some, the vegetarian strictures common in Hindu-dominant India distinguish its cuisine, even considering the countless regional variations in a nation of 1.35 billion people. 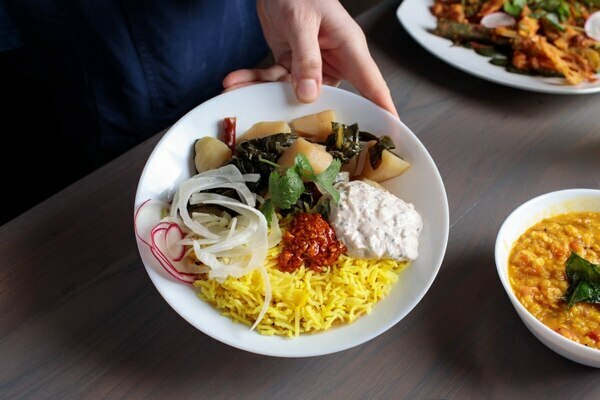 Bhuna acquits vegetarianism ably, highlighted by Kashmiri kohlrabi and collards ($13). I can't improve on the comments offered by former WW critic Matthew Korfhage describing this dish during Bhuna's pop-up days. After extolling the umami-depth and "leeklike smoothness" of the asafetida that joins chilies and garam masala spice blend as a base, he described the collards as "all funk and comfort, the feeling of easing into a '70s couch cushion." Each of these entree-sized offerings arrives as an ensemble, served over flavorful turmeric basmati rice along with a small pool of cooling raita and a dollop of pungent, salty-hot achaar—an underappreciated Indian condiment typically relying on unripe fruit, such as mango or lime, pickled in salt, chilies, spices and oil. Do yourself a favor and ask for a little extra achaar on the side. You will either hate it on its own or become a hopeless addict. 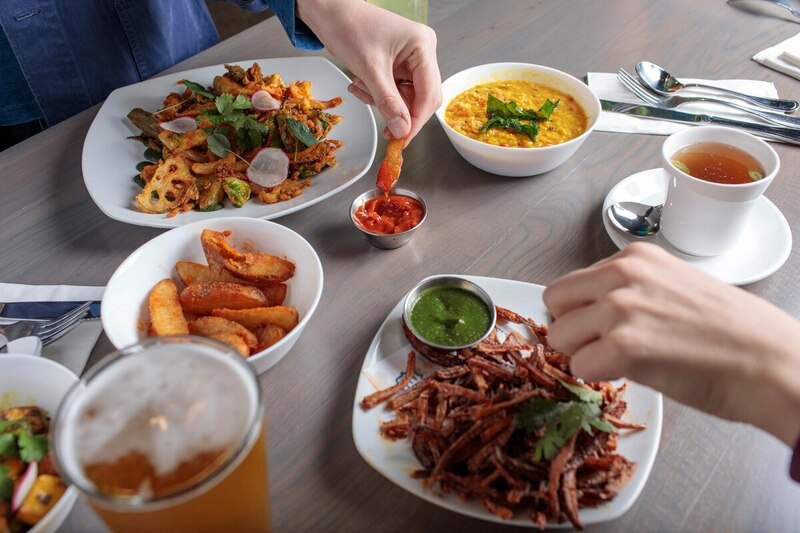 A meal at Bhuna is best anchored by one of the entrees, but be sure to start with lotus root fries ($5), all glorious salt and grease like french-fried potatoes, but with a little chew and served with a ramekin of memorably spicy cilantro and mint chutney for dunking. Also fresh from the fryer: rings of chickpea-battered squid drizzled with tamarind sauce ($9). Though delicious, I wish the sauce didn't turn the crunchy coating soggy. The naan ($4) isn't quite dialed in yet either, though I was told the chef is still working out the kinks. 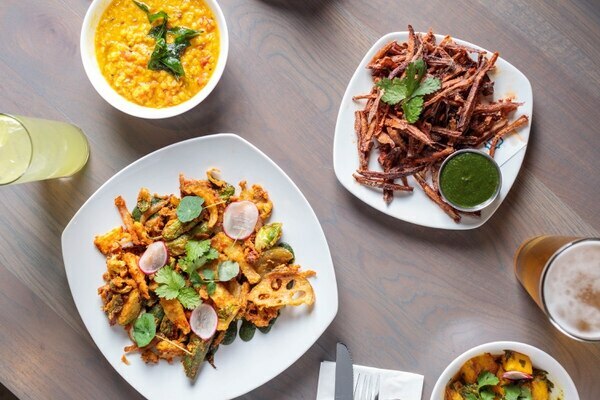 For those who equate Indian food with the curry houses of yore, or who are habituated to the other Indian standouts in the Portland area—Dil Se, Chennai Masala and Tiffin Asha come to mind—be prepared for a very different experience at Bhuna. Do not be put off by the slim menu and jarring brightness. The blast of flavors and their telltale after-effects warrant a visit whether you live in the neighborhood or are making a trek from elsewhere. EAT: Bhuna, 704 NW 21st Ave., 971-865-2176, bhunarestaurant.com. 11 am-9 pm Tuesday-Saturday, 3-9 pm Sunday.